The Cuomo admin released these images for the project today (we gif'ed them). Here are more, and larger, images. 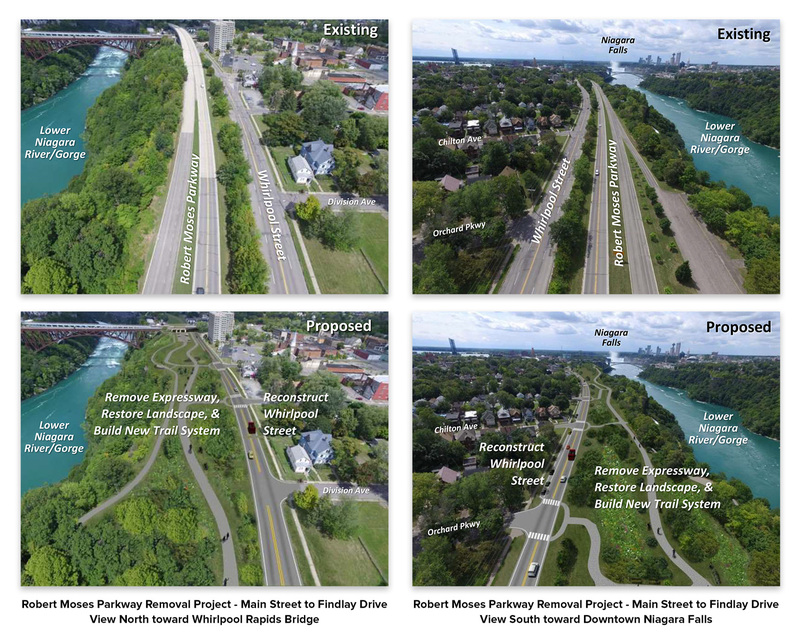 There are a lot of differences between the Robert Moses Parkway and 787 -- including scale. The parkway carries not quite 3200 vehicles a day, according traffic volume estimates. The segment of 787 just north of the South Mall Expressway carries almost 46,000 vehicles. But if you're a tear-down-787 person, some of the remarks Andrew Cuomo made today might make your ears perk up. Now, part of what we are talking about and what we are doing is correcting past mistakes. The Robert Moses parkway, sometimes we have great intent and we execute it poorly. Robert Moses parkway was not a good idea to put it in the place that it was placed. The mayor is exactly right and then for a lot of year, we talk about how, "we should really take up the Robert Moses parkway." But it was said in that vein of, "we could never do this. But we should take up the Robert Moses parkway. But you couldn't." Why? "Because it is too big, too bold, too expensive. It is just too ambitious. Too ambitious." And part of my point was that there is nothing too ambitious for New York. We lost our mojo, forgetting who we are we better look in a mirror. Too ambitious for us? We are a state of people who were told "you can't" right? And we said, "yes we could!" That is part of bringing back western New York's energy and growth. Believe in you. It is a highway, it is asphalt and concrete, we get a shovel and we hit it enough times it cracks up, it gets loose, we pick it up and we put it in a truck and there is no more highway. That is just what it is. So don't tell me that we can't do it and as a metaphor for yes we can, yes we can do big things, yes we can make this a better place, yes the future can be brighter. Doing the Robert Moses parkway is just that. It is just that. We all knew it was a mistake but it was there and for too long and nothing was done about it and now we said we are going to come back and we are going to redo it and we are and this is just the first phase. Today I am pleased to announce $40 million to do the second phase and to complete the project. Converting 787 into something like a boulevard in downtown Albany isn't going to cost $40 million -- it would probably be something more like $400 million. As officials said last year in reference to 787, the money just isn't available. And, as we wrote back then, we still suspect that any major change to 787 will be the result of some outside force intervening -- like a governor deciding to make it a showcase economic development project, or the state plowing some sort of windfall into infrastructure spending. But someone just said there's "nothing too ambitious for New York." So maybe. Someday. There ought to be more than two options in the conversation about 787. For instance, see Gardiner Expressway in Toronto.